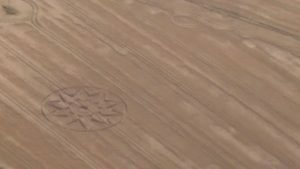 A summer hot air balloon ride over Wiltshire can be particularly rewarding at this time of year as you may get a sighting of a mysterious crop circle in the fields below. Wiltshire is a rural county covering an area of 3,500 sq Km, is full of diversity with superb countryside, market towns, the famous chalk hill carvings of the white horses and plenty of ‘mystical forces’. Wiltshire is also home to the famous World Heritage site of Stonehenge, an ancient stone circle of which the true meaning has been lost in the mists of time. 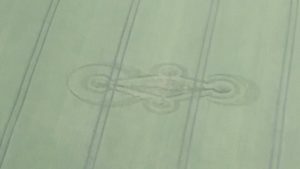 During the summer crop circles appear in the fields in the centre of Wiltshire’s numinous landscape and do seem to have an affinity for ancient sites. Many circles appear close to stone circles, barrows, earthworks and other landmarks. 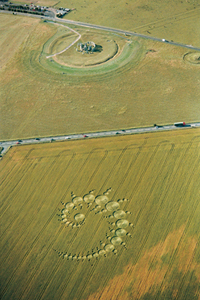 Stonehenge and Avebury have played host to many crop circles over the years. The Crop Circles usually appear overnight, in the few short hours of darkness in the summer months. Most are completely perfect at first-light with no flaws in their designs! Hot Air Balloon flights meet at our central Salisbury launch location from August 1st. Salisbury is a traditional English cathedral city with medieval roots mixed with the vitality of modern life. The city boasts five rivers running through the town – Nadder, Ebble, Wylye, Bourne and Avon and is home to the world’s oldest working clock. To fly with us from Salisbury please book online or call the booking office to reserve your places on 01404 823 102.